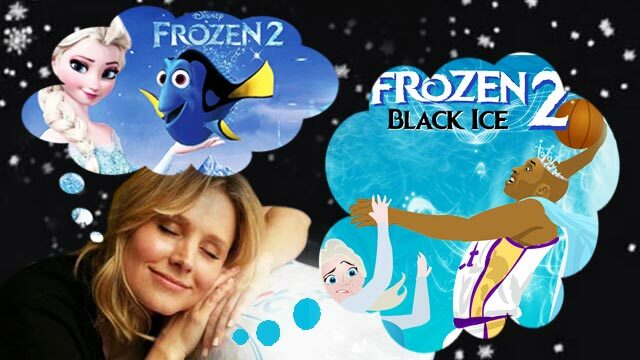 #Frozen2: The Funniest Internet Reactions And The Quest For The Best #FrozenSequelTitles! The Internet just can't let it go. We caught wind of the rumors a few months ago, but just earlier today, the guys from Disney finally dropped the bomb: It's official, the animated hit Frozen will have a sequel. That means that we'll see a lot more of Elsa and Anna, learn more pick-up lines from Olaf the talking snowman, and find out if the Snow Queen will finally meet his Prince Charming. And don't pretend you didn't like the first one and are dreading being dragged to this one by your lady/daughter. You know you want to watch #Frozen2. But the most important question of them all is this: Just wow the hell are they going to top this song? We apologize for your LSS, we just want to point out how gargantuan a task Disney has decided to undertake. They'll need all the help they can get. Heck, word has it that even Kobe Bryant wants in! But it's not only the Los Angeles Lakers superstar (or his animated self, to be exact), who gave his thoughts about the next Frozen. We compiled below the best reactions on the Internet about this highly anticipated sequel! All these just prove that everybody has yet to let it go! Ellen DeGeneres is already thinking of a blockbuster crossover! While Kirsten Bell, the actress who voices Anna, seems pretty chill about it. Snape, on the other hand, is slithering his way to get his students to get casted. This one's a pretty cool suggestion. While this one makes things really intense! With the sequel's announcement, maybe we can finally dismiss this one, right? The quest for the best #frozensequeltitles is currently trending on Twitter. Hold up, what if they use this one? Never mind, let it rip, bro! GEEK QUESTION OF THE DAY: Which Superhero Is Richer: Batman Or Iron Man?